On this lazy Sunday afternoon, where the temperature is finally starting to feel tolerable and the sun is shining strong, there's nothing I'd rather do than crack open a couple of tall ones and sit back to enjoy my last few hours of the weekend. Unfortunately, though my fridge is well-stocked, the only thing I have to drink is bottled water. not quite the same thing. So, in lieu of a couple of delicious, craft tall ones, I'm going to sit back and enjoy a couple of hockey "tall ones;" Parkhurst Tall Boys that is. In 1995, Upper Deck used the Parkhurst brand to create a "what if?" set of hockey cards. In 1964-65, Parkhurst did not issue hockey cards, so Bryan Price (Pres. of Parkhurst) decided to fill in that gap. Since Topps' hockey offerings grew to 2 1/2 by 4 11/16 inches around that same time, Price and Co. decided to increase the size of their theoretical set, as well. My LCS had a box of these gap-fillers hidden behind the counter of their hockey section, marked as .25 a piece. For oddballs with vintage hockey players who would otherwise be much harder/more expensive gets, I definitely wanted to take a look. Unfortunately, some hometown Joe had already uncovered this hidden box before me, as all of the Blackhawks had been picked out. Drat. However, I was able to dig up a couple of guys who had played for the 'Hawks previously, including this Reg Fleming. Fleming was a brash, popular player throughout his five seasons in Chicago (1959-64), with his physical and aggressive style of play helping the franchise to a Stanley Cup Title in 1961. He bounced around the league for the rest of his career; but, he did come full circle and wrap up his career in the Windy City. But, that stint was actually with the Chicago Cougars of the WHA. Coincidentally, both of my former Blackhawk finds were of the Boston Bruin variety. Murray was a member of the famous "Million Dollar Line" with Bobby Hull and Bill Hay when he called Chicago his hometown (1959-64). 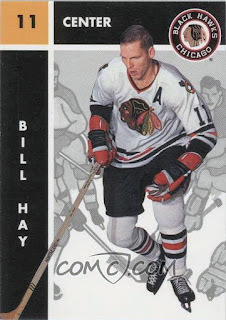 Also a member of the 1961 Stanley Cup winners, in the fifth game of the set, he crashed into the Detroit Red Wings net and broke his arm. Thus, he ended up watching the final game from the hospital. Traded to Boston in the same season this Parkhurst set wanted to fill the gap for, it was soon discovered that Murray had a tumor in his lung. His hockey career was immediately ended and he passed away tragically at the age of 28 in 1965. So, had this set been produced at the actual time, this would have been his last trading card. Murray's cohorts on the "Million Dollar Line." If anyone's got an extra Bill Hay lying around, let me know! And so, both of these "tall ones" will occupy spots in my Blackhawks All-Time Roster Collection until (if/when) I can locate affordable, properly attired examples for the binder. In the meantime, these bad boys make for some pretty sweet placeholders. I should really be wrapping this post up, as I do have some errands to run before the fiancee finishes up her shift at work (which actually lead to a bizarre card-related find today, more on that in a future post). Perhaps I'll actually pick up a six-pack while I'm out so I can have both my metaphorical "tall ones" and a few actual tall ones as well. I was really fortunate to find a complete set at a nice price years ago. It's still one of my favorites. Nice! Always loved that set as a kid. great cards - for hockey. ;) actually, I'm quite drawn to hockey cards, esp goalies (not unlike my love for catchers.) Prob a good thing I only collect baseball. It's saving me hundreds of dollars. You need to get some beer. Chicago is such a great beer town! The tall boy cards are awesome, just a little difficult to protect.